2 by 3 Heroes: The Big Sort: And so it begins. I talked a few days ago about the mess that I like to refer to as "my White Sox collection". I figured out what I could use for a table in my card room, so I began the long task of organizing. I figured during the sort I would find many gems, and it didn't take long to find two cards that finally answer a question that has bugged me for months. Hopefully, you know my love of stirrups and high cuffs. Pajama pants look like total crap. Dress like a ballplayer, not like a bum. Now pitching - ball player. Now batting - slob. 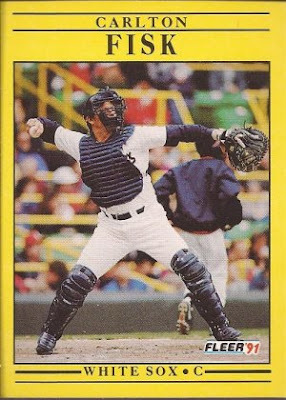 While I have been searching and setting aside cards featuring properly attired players, one position has failed to appear - catcher. 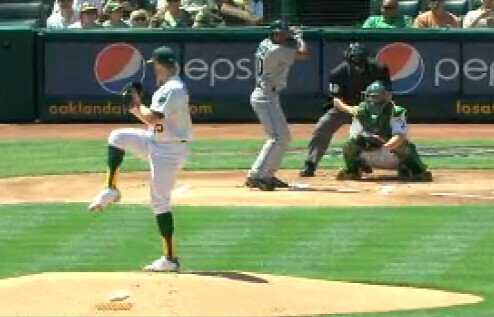 Now, if I was to determine the first position that would adopt longer pants, I would say the catcher. I'm sure the shin guards feel more comfortable without bloused pants. Yet, we all know a good 30 years ago, pajama pants were the exception and not the norm. 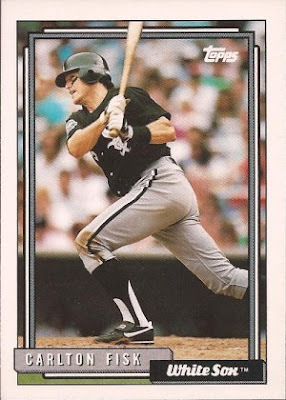 Another known is that, up until he retired, Pudge Fisk always wore stirrups. Pictured - Hall of Fame ball player. 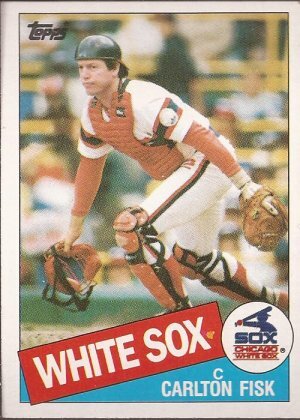 Now granted, I could Google image search and find a photo of Fisk with high cuffs while behind the plate. But those are not a baseball cards. I need to find a card that can put official scorer's position #2 in the high cuffs binder. Pictured - greatest dressed Hall of Fame player. Less than an hour in and paydirt. Many many stacks to go, but the sorting can only get better, right? I still catch, and when catching, wear the pants down to the ankles. When batting, I pull them up. You kind of have to have them down so the lower bits of the shin guards fit properly and don't produce too many dangling elastic triplines. Its a comfort thing, too, and they can eventually erode through a pair of socks. That's one of my top five favorite Corey Hart songs, hands down.